Getting back in the Groove. I had an awesome grocery shopping trip at Publix this week. I found a lot of great deals and was able to stock up on a few staples for the winter months. This week I did a good job buying only what was on my shopping list. I was also more diligent at passing up items that I did not have coupons for. Resisting impulse buying while shopping really drives your final total down. Not taking kids with you shopping also helps to keep the total down because you can shop without distractions and find the best deals. Once again, I was able to keep my grocery bill under $100.00 this week. My total prior to BOGO and sales was $155.68. I paid only $79.25 saving a total of $76.43. In addition to my groceries I purchased two greeting cards at a cost of $4.75. Every time I think I am too tired or too busy to clip coupons and match up sale advertisements I remind myself that if I don’t take the time to coupon shop I am robbing my family of money that can be used for other things. Since we donate a lot of what we purchase I am also robbing my family of the chance to help others in need when I don’t take time to coupon shop. 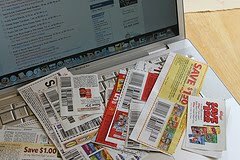 For about 9 months I was in the groove- I was a coupon shopping saving freak. Then something happened, I guess you can call it life and I relasped back into my old ways of grocery shopping. Which meant shopping with no list, no coupons and just buying whatever I wanted to buy. Of course with the old habits the old dread of grocery shopping, and the shock of the bill at the end of the trip returned. Now that I am feeling better I decided that I needed to get back into the groove and start saving money again on my weekly shopping trips. Today my bill totaled $167.45, after coupons and store specials I paid $56.25. Not a bad start to my getting back in the groove. Dial soap at .33 per bar.